Featured above: An artist’s rendition of President Reagan’s proposed Strategic Defense Initiative. Video Evidence: Not much in the way of notes this week, but two videos: The first does a good job explaining metallic bonding, and the second… well, it doesn’t explain cricket, but you can try to make some sense of what’s happening while watching Dennis Lillee employ the ComBat. Naming conventions for the elements have gone through various trends at different points in time, much like baby names do. For a while, it was popular to name elements after their various properties, like their color or odor. Then, naming elements after mythological figures was all the rage. Several of the most recently discovered atoms have been named after notable scientists. But around one fifth of all the elements are named after particular places on Earth. Sometimes this was because of nationalist zeal, and other times, simply because that’s the place that element was discovered. That makes a fitting origin for Element 21. For better or for worse, scandium seems to find its way to the heart of international conflicts on every scale, from lighthearted sports to the coldest of wars. Today, we’re launching into a discussion about scandium. We’re meeting a new breed of element with scandium. So far, we’ve discovered alkali metals, alkaline earth metals, metalloids, non-metals, and even one post-transition metal — aluminum. But it’s only now, in the fourth period, that we finally bump into the transition metals. The transition metals bridge the gap between Group 2 and Group 13, and they actually make things sort of conceptually murky. Up until now, every element we’ve seen has behaved similarly to its neighbors in the same column. That trend doesn’t completely go away with the transition metals, but it’s much less pronounced. For the next ten episodes, we’re going to be learning about metals whose behavior is much more consistent than we’re accustomed to seeing across periods. If you’re looking to point fingers, we can round up the usual suspects: electrons. You probably remember that an element’s chemistry is largely determined by the electrons in its outermost orbit, also called its valence shell. Until now, we’ve been adding one electron to the valence shell for every proton we add to the nucleus. When the valence shells become full, as with the noble gases, we start plunking electrons down in a new shell, farther away from the nucleus. But the transition metals are pretty massive, and they’ve found some extra interior space where they can tuck away new electrons. It’s kind of like storing your extra stuff in a guest bedroom instead of throwing it out on the street. Until that space is crammed full of its own electrons, the valence shell doesn’t receive any new electrons. So all the transition metals have similar numbers of electrons in their valence shell — and because of that, their chemistry is similar. But it’s not identical, and thank goodness for that, because that means as we traverse the periodic table in order, we won’t be stuck in a rut for weeks at a time. When Mendeleev drew up his version of the table, he predicted the existence and behavior of several elements that hadn’t yet been discovered. His peers thought his forecasts were oddly specific and irrational. When Paul-Emile Lecoq de Boisbaudran not only discovered gallium in 1875, but discovered that it had all the chemical properties that Mendeleev predicted, scientists brushed this off as mere coincidence. But when the same thing happened with scandium four years later, some chemists started to admit that maybe he was on to something. By the time germanium was discovered in 1886, Mendeleev’s scientific victory was secured. Scandium played a small but important role in that victory, and less than a century later, it had wormed its way into a similar position in a different conflict, one that also involved men from Moscow, but with considerably higher stakes. It’s been a little while since we’ve talked about atomic bonds. In episode six, Carbon, we learned about covalent bonds, when atoms share valence electrons. In episode 11, Sodium, we discussed ionic bonds, when one atom donates electrons to another and the two remain attracted because of their now-opposite charges. Covalent bonds tend to happen between non-metallic elements, like hydrogen and oxygen. Ionic bonds, meanwhile, are usually formed between metals and nonmetals, like lithium fluoride. There is one more kind of atomic bond we haven’t discussed yet: Metals can fuse to other metals in a process known, appropriately enough, as metallic bonding. Metallic bonds are a little weirder than ionic and covalent bonds. Those free-flowing electrons are now effectively shared by the entire body of metal, and this is precisely what gives metals their unique properties of malleability, ductility, conductivity, and reflectivity, as we discussed in episode five, Boron. There’s no requirement that all the atoms in a metallic bond be the same kind of atom. When different metals are mixed and bond together, the result is called an alloy. Alloys often combine the best properties of their ingredients, to form something greater than the sum of its parts. And they don’t need to be mixed at a 1:1 ratio, either. As we’ve learned, if there’s one industry above all others that values high-strength, low-weight materials, it’s the aerospace industry. And scientists discovered the usefulness of the aluminum-scandium alloy during a period of time when that industry conducted some of its most creative work: The Cold War. To simplify a great deal, the Cold War was a fifty-year long global conflict in which the United States and the Soviet Union came up with increasingly elaborate ways to destroy the world. The more bombs each side had, they figured, the less likely either would be to use them, because the resulting conflict would kill everyone involved. This ploy was fittingly called MAD, or Mutually Assured Destruction. Both countries possessed many thousands of nuclear missiles, which allowed them to have some fun trying to find places to stash them. They built special airplanes that could stay aloft for days at a time while carrying atomic bombs. They asked their friends to hold on to some missiles for a while, like Cuba and Turkey. And they built ships and submarines capable of striking practically any target on the planet. That last one caused some trouble for the USSR. While the Soviet coastline was almost twice as long as the United States’, almost all of that coastline bordered the frigid waters of the Arctic Ocean. So the Soviet Navy had to consider some unique problems, like: What if a submarine is submerged beneath a thick sheet of ice when it needs to launch a nuclear missile? The Soviets also used scandium in the construction of their jet fighter aircraft, the MiG-29. But the Soviet Union didn’t have an exclusive hold on Element 21. Scandium played both sides. It’s not just good for making strong, light metals. When combined with gallium and gadolinium, scandium forms a kind of crystal that can be used to construct high-powered lasers. Exactly the kinds of lasers that were required for Star Wars. 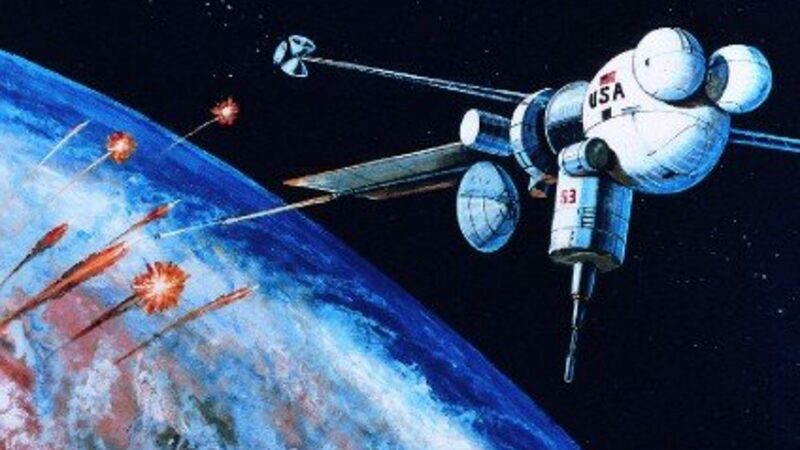 The idea put forth by President Ronald Reagan was that a network of satellites would constantly keep an eye out for nuclear missile launches anywhere on earth. If one was detected, lasers would immediately destroy the missile before it could strike. The plan was derisively called “Star Wars” by the press, but not because it was a fantasy. If anything, people were terrified that the system could actually be built. Remember the doctrine of Mutually Assured Destruction? The Strategic Defense Initiative really threw a wrench in that plan. If the United States possessed a tool that could nullify an enemy’s nuclear weapons, then destruction was not mutually assured. And if destruction was not mutually assured, that tilted the scales in favor of whoever drew first blood. In short, Reagan’s plan to defend the country with space lasers threatened to plunge the entire world into nuclear holocaust. This kind of absurdly counter-intuitive scenario was typical for the Cold War. If it’s reminiscent of any classic film, it’s not Star Wars — it’s Doctor Strangelove. But scandium’s most notorious application was not in the Cold War, nor a Star War. Element 21 garnered its most notorious attention as an integral part of the ComBat. ComBat, y’see, was the brand name of a scandium-aluminum bat wielded by Dennis Lillee in a game of cricket. Lillee was batting for the Australian team in a test against England in 1979. Traditionally, cricketers used bats made of willow, but Lillee used the Air Bud defense: There was nothing in the rules that said he couldn’t play with a technically superior instrument. This caused quite a commotion, especially after giving the ball a right solid whacking that very nearly went for four. And this was no schoolyard match, this was the second day of an international test series. Granted, The Ashes weren’t at stake, but the Aussies had ended the prior day at 232 for 8. Lillee played the rest of the match, begrudgingly, with a wooden bat, but it’s not like his team needed the unfair advantage. Australia won the series 3-0. The official rules of the game were quickly revised to require a bat made of wood. But it seems that beating England in a test match might not have been Lillee’s primary goal. The ComBat, it turned out, was intended for use in schools and developing countries, not the professional cricket pitch, and it just so happened to be manufactured by Lillee’s friend Graeme Monaghan. Sure enough, the ComBat flew off the shelves following Lillee’s little stunt, and some percentage of those sales went directly into his pocket. If you don’t desire a perfectly pure sample of Element 21, there are a few options available to you. But your best bet is probably in the sporting goods department. Metal bats might be banned in professional cricket and Major League Baseball, but scandium-aluminum alloys are still popular elsewhere in the wide world of sports. Lacrosse sticks, tennis rackets, and golf clubs sometimes employ the material for its strength and light weight. So do bicycle frames, but these days, that’s usually not a selling point. Scandium-aluminum bicycle frames were all the rage in the early 2000s, and considering scandium’s rarity, they sold for quite a high price. Sellers with few scruples soon started selling counterfeits, which had a nasty tendency to fall apart — often while they were being ridden. It was actually because the advertised element was not present that the fake frames were so inferior, but that still did considerable damage to scandium’s reputation in the cycling community. If you purchase an aluminum-frame bicycle today, it almost certainly contains a small amount of scandium. But you might have difficulty getting your bicycle salesman to admit it. Scandium is actually present at pretty much every professional sporting venue you can visit, but you’ll need to look up to find it. Like several of the elements we’ve discovered so far, Element 21 has luminiferous properties. Running an electrical current through scandium-mercury vapor creates a light that has a pleasingly white color and intense brightness — good for athletes, spectators, and cameras alike. And, happily, an athletic application for scandium that’s entirely free of scandal. Thanks for listening to The Episodic Table of Elements. Music is by Kai Engel. To watch videos that help visually explain complicated ideas, like metallic bonding and cricket, visit episodic table dot com slash s c.
Next time, we’ll remember the titanium. This is T. R. Appleton, reminding you that you can’t fight in the War Room. Swedish Chemical Journal, Lars Fridrik Nilson. Issue 11, 1899. Run it through a translator. Encyclopedia Britannica, Metallic Bond. Last updated April 4, 2016. The Properties And Application Of Scandium-Reinforced Aluminum, Zaki Ahmad. The Member Journal of The Minerals, Metals & Materials Society, February 2003. Aluminium Insider, Are Aluminium-Scandium Alloys The Future? Goran Djukanovic, July 28, 2017. Minor Metals Trade Association, Scandium. New Scientist, Star-Wars Intrigue Greets Scandium Find. Tony Samstag, May 28, 1987. Cricket Country, 1979: Dennis Lillee Walks Out To Bat With An Aluminium Bat! Arunabha Sengupta, December 7, 2015. Thomas Jefferson National Accelerator Facility – Office Of Science Education, The Element Scandium. Steve Gagnon.